Intercede before it happens Watch your child during playtime. When you see her becoming frustrated or angry – intervene. Coach her through the issue. Teach her what to do, or model what to say to her friend. Or if she seems too upset to learn, redirect her attention to another activity until her emotions level out. Teach and explain It’s one thing to tell a child what not to do or to step into an argument and solve it yourself. It’s another thing entirely to teach her what to do in advance of the next problem. This can be done through role-play, discussion, and reading a few children’s books about angry emotions. Examine hidden causes Is your child hungry, tired, sick, jealous, frustrated, bored or scared? If you can identify any feelings driving your child’s actions you can address those along with the aggressive behavior. Teach positive physical touches Show your child how to hold hands during a walk or how to give a back rub or foot massage. Teach a few physical games, like tag or cat’s cradle. Under direct supervision, children who are more physical can gain a positive outlet for their physical energy. Teach the clapping method Tell a child to clap his hands whenever he feels an urge to hit. This gives him an immediate outlet for his emotions and helps him learn to keep his hands to himself. An alternate is to teach him to put his hands in his pockets when he feels like hitting. Reward with praise anytime you see he’s successful. Give your child a time out To use Time Out when a child acts out aggressively, immediately and gently take the child by the shoulders, look him in the eye and say, “No hurting others, time out.” Guide the child to a chair and tell him, “You may get up when you can play without hitting.” By telling him that he can get up when he’s ready, you let him know that he is responsible for controlling his own behavior. If the child gets up and hits again, say, “You are not ready to get up yet,” and direct him back to time out. 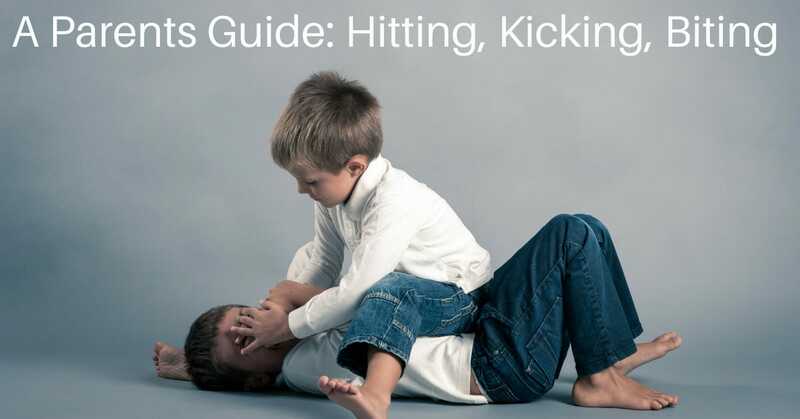 Avoid play hitting and wrestling Young children who roughhouse with a parent or sibling during play time might then use these same actions during non-wrestling times. It can be hard for them to draw the line between the two. If you have a child who has trouble controlling his physical acts then avoid this kind of play. Don’t lose control When you see your child hurting another child it’s easy to get angry. This won’t teach your child what she needs to learn: how to control her emotions when others are making her mad. You are mad at her, so she’ll be watching how you handle your anger. Don’t let your child watch violent TV Children can become immune to the impact of violence, and they may copy what they see depicted on television. Avoid viewing shows that portray aggression as an appropriate way of handling anger. Don’t assume your child can figure it out If your child comes to you about a difficult situation, don’t send him away for tattling. But don’t step in and handle it for him, either. View his call for help as an invitation to teach him important social skills. Don’t focus on punishment More than anything your child needs instructions on how to treat other human beings, particularly during moments of anger or frustration.